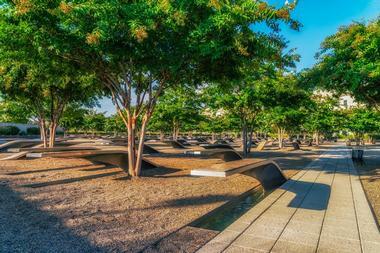 The Pentagon Memorial is an outdoor memorial located southwest of the Pentagon in Virginia's Arlington County. The memorial pays tribute to the 184 victims who lost their lives in the 11th September 2001 tragedy by remaining open 365 days a year and 24 hours a day, Monday to Sunday. The Pentagon Building is the symbol of US Military as it serves as the headquarters of United States Department of Defense, also located in Arlington County, Virginia. The building is the world's largest low-rise office building and was originally completed 15th January 1943. The building is the command center of the US military establishment and houses around 24,000 military and civilian employees. Following the 9/11 tragedy, the building underwent a renovation and construction program, wherein the impacted building portions were demolished and rebuilt in less than a year from the date of 9/11 disaster. The Pentagon was a target among a series of four coordinated terrorist attacks planed by al-Qaeda, an Islamic terrorist group. American Airlines Flight 77, a scheduled flight from Washington Dulles International Airport to Los Angeles International Airport, was hijacked by five people when the flight was over eastern Kentucky on 11th September 2001. The flight was then steered to approach the Pentagon from the west and was made to strike the western face of the Pentagon. The American Airlines Flight struck the Pentagon at 9:37am (EST), taking 125 lives from the Pentagon and the lives of 59 passengers on Flight 77 as well as the five hijackers. 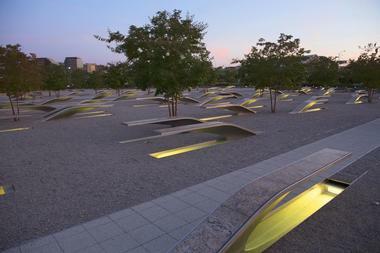 The Pentagon Memorial is spread across 2 acres of park, which was designed by Keith Kasemen and Julie Beckman. The memorial ground honors the lives of all those who perished on that tragic day by permanently inscribing every victim's details and location at the time of the tragedy. All of the 184 memorial units stand out in their unique direction and the placement vividly tells the tale of the tragic events. The memorial was completed and dedicated to 9/11 victims and their families on 11th September, 2008. 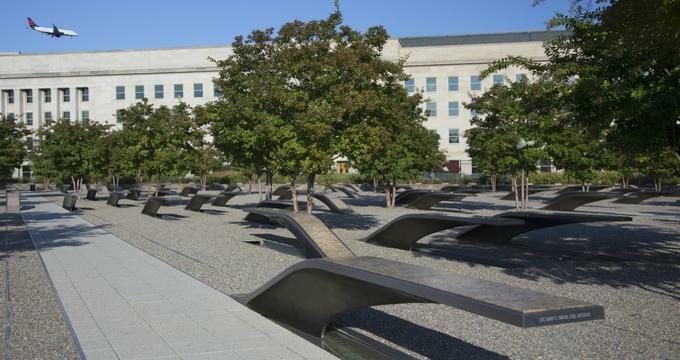 The Pentagon Memorial Fund has set up the visitor education center that caters to the thousands of children and students visiting the memorial. Public donations are accepted to maintain the memorial and the education center. The Pentagon Memorial welcomes special events organized at the memorial from time to time. Organizations or individuals wanting to hold a special event here must submit an application to the Pentagon building management for a permit to use the space. The wreath laying ceremony is one such event that is routinely organized at the memorial.